From a research and practical perspective, it is important to allow users to add their own strategies and compare with the existing state of the art. This template file essentially follows Protocol 1, as shown in the problem setting of OLPS. After having coded this strategy, the next task is to allow the toolbox to be able to read the Strategy details so that it can be run on several datasets, and be compared with others. This can be done in both the GUI mode and the PGUI mode. 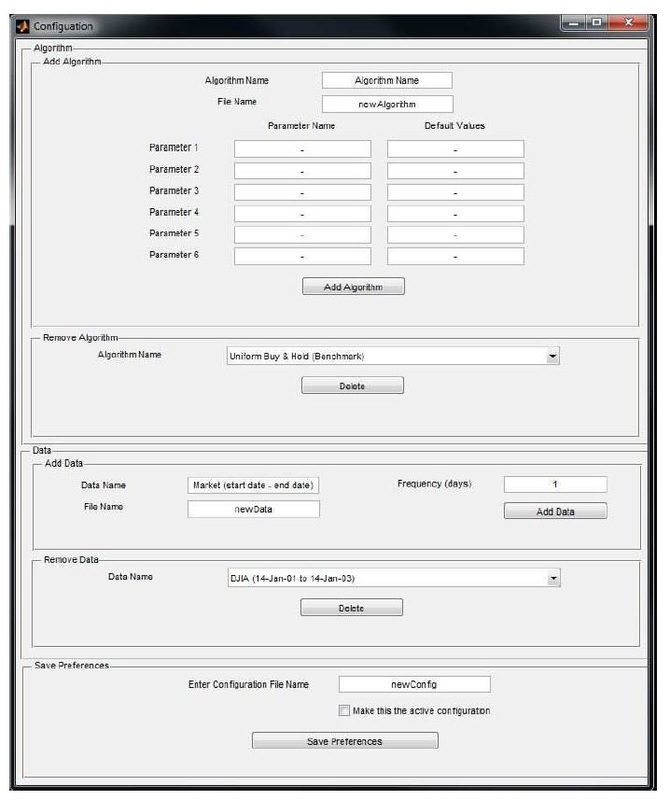 For the GUI mode, the configuration option can be used to enter the details of the algorithm. The name of the algorithm to be displayed in the toolbox, the file name containing the code, the parameter names, and their default values are required as input for the algorithm to be incorporated into the toolbox. Alternately, users can add strategies using the PGUI. This however requires the creation of an additional config file for each strategy that is coded. A sample configuration file is provided in the toolbox "template_config.m". The config file for each algorithm essentially requires the same information the the GUI-configuration wanted. The menu-driven PGUI then offers straightforward functionality for the new strategy to be read by the toolbox.